This apartment boasts incredible skyline views of downtown Austin from your own private patio. The building is also equipped with a gym and infinity pool on the roof deck. Right downstairs you have all of the Rainey street bars and restaurants. You're also a 5 minute walk to sixth street and the convention center. 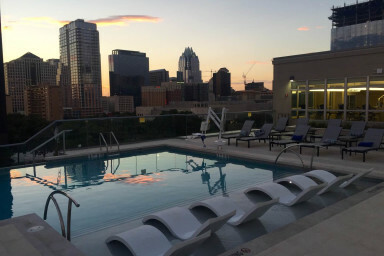 Whether a solo traveler or a family you will have access to the best Austin has to offer from this convenient Rainey Street location.